Autocar is the car nut’s weekly fix, delivering you a unique mix of the latest news, opinion, features, first drives of new cars and in-depth road tests – all complemented by the best photography in the business. No other magazine covers the subject you love with such enthusiasm, insight and quality every week of the year. 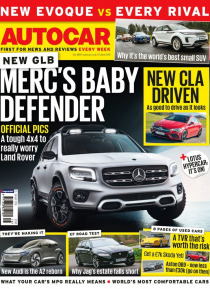 Autocar stands for the highest quality in car journalism – and is rew… arded with access to the best new cars and the biggest news stories before any of the opposition which we share with you, our readers, every week.